Romi asks: How did the “pie in the face” gag get its start? The very first known “pie in the face” gag, also known as “pieing”, was in a movie- which movie is a matter of dispute. It is definitely agreed that the first film “pie in the face” was thrown in a silent comedy in the early days of movie making. After this point of agreement, there seem to be two schools of thought. Some say Mabel Normand, the first great woman comic in movies (“The Female Chaplin”) threw the first movie pie at “Fatty” Arbuckle in a 1913 Keystone comedy called “A Noise from the Deep”. Others believe the first movie pie was tossed at cross-eyed comedian Ben Turpin, not Arbuckle. This pie was supposedly thrown at Turpin four years earlier, in the 1909 Essanay comedy called “Mister Flip”. From these silent films, the curiously funny pie in the face gag grew to the slapstick comedy staple we know and love today. Perhaps the first truly great pie fight in cinema was in the 1927 Laurel and Hardy silent film “The Battle of the Century”. This is, quite possibly, the biggest pie fight ever staged in a motion picture. It is reputed that 4,000 pies were used in the pie throwing scene. (The entire day’s output of The Los Angeles Pie Company was used). Unfortunately, much of this great pie throwing masterpiece has been lost because of the lack of care given to the early silent films- much of the film is “lost” due to the film simply decomposing. And who could mention pie throwing without bringing up the greatest pie throwers of them all- The Three Stooges. Moe Howard, the Stooge leader, was an expert pie thrower and it is actually him that throws many of the accurately tossed pies in Stooge films. Moe was so adept, in fact, that when other movies needed pies thrown, Moe was often hired to come on the set to do the job. The Stooges’ pie fight in In the Sweet Pie and Pie (1942) is possibly the funniest, most perfect pie fight in movie history. The Stooges’ “Three Sappy People” (1939) also includes a hilarious slight-variation, a wonderful cream puff-throwing scene. In 1946’s “Half-Wit’s Holiday”, a wonderful Stooge pie fight is featured, albeit without Curly. During the filming of the short, Curly had a massive stroke, ending his brilliant career as the super Stooge we all know and love. Moe and Larry took up the slack in the pie-throwing scene along with cuts of extras and bystanders were used to fill Curly’s void. Perhaps the strangest, most surreal movie pie fight is in the 1930 “Our Gang” comedy short “Shivering Shakespeare”. It features slow-motion, weird camera angles and marvelously telegraphed pie attacks reminiscent of a Greek tragedy. 1965’s “The Great Race” promised “The biggest pie fight in movie history” in its ads. The pie fight was huge (2,357 pies were used) but somehow, in my opinion, it lacks the greatness of the Three Stooges or Laurel and Hardy. Natalie wood, the film’s leading lady, actually had her mouth open during the pie throwing scene and part of a thrown pie went down her windpipe. Natalie had a severe choking bout, but luckily, she was not seriously hurt. Jack Lemmon, who played two roles in the film (and thus got hit by twice as many pies), was actually knocked out cold during the pie throwing scene. 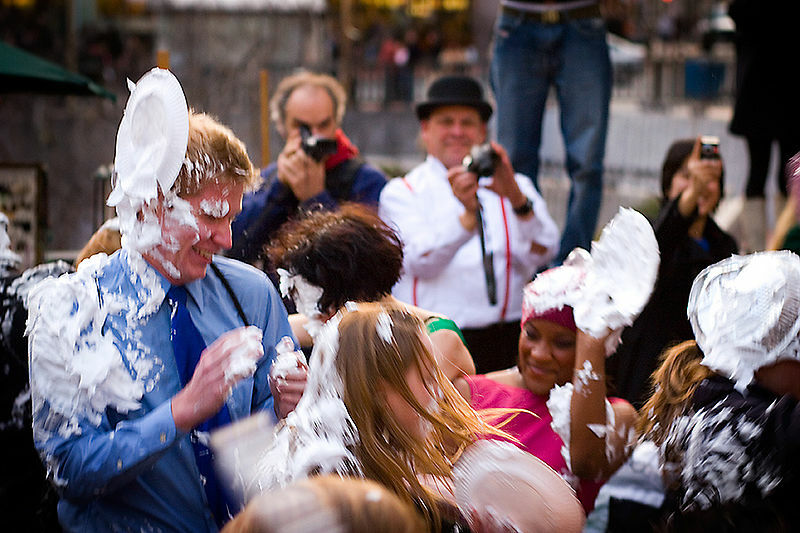 This pie throwing scene was started right before Labor Day weekend and the resulting cream pies were left on the walls and scenery for three days in the hot summer. When the cast and crew returned, the smell was terrible and the stench of the old pies made the remainder of the scene quite unpleasant until a few brave stagehands cleaned up the bad-smelling mess. In 1976’s “Bugsy Malone”, there is a weird variation on the classic pie throwing scene. In it, a gun is used that shoots not bullets, but pies. The greatest “never used” pie throwing scene in film history was in 1964’s classic “Dr. Strangelove”. A climactic pie-throwing scene was actually filmed between the Generals and politicians in the war room. Only one take of the scene was filmed because of high costs. In the unused scene, director Stanley Kubrick had Generals throwing pies at various members of government and the military. However, Kubrick felt the jubilation of the actors playing the Generals was inappropriate and luckily decided to scrap the scene (luckily because of what was soon to happen). Still think the best pie fight was “The Great Race”! Also a classic movie for funny quotes! No article on Pie-in-the-Face is ever complete without Soupy Sales! Even Frank Sinatra got a pie in the face on the Soupy Sales Show. -shame you left his pie face out of this article.